Chocolate is the perfect solution for a tough, emotionally exhausting week. What is it about chocolate that makes everything feel better? Today, as I was dipping 200+ truffles into melted chocolate, CandyMan asked why I was making so much candy. Special occasion, maybe? Do you need an excuse for chocolate? Not this week, that’s for sure. 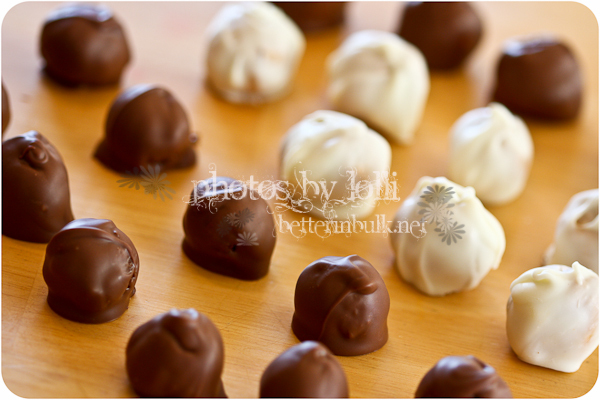 If you’d like to see how I made these peanut butter and chocolate dipped truffles, I just happen to have detailed recipe and instructions. You’re welcome. « San Francisco. Yes, Again. Chocolates have been thought as very good stress busters for long, and just a sight of it lets your body swing with happy hormones. And yes! me too am a very big chocolate lover. Personal i don’t know any women who didn’t like chocolate. I like milk chocolate and chocolate hazelnut, i eat one or two times per week but in small quantities. Chocolate it make me feel i’m in heaven. Your picture make me to go and buy a litlle chocolate, hmmmmm! Did you say chocolate? Oh yeeees! Chocolate is one of our biggest pleasure, but we musn’t exaggerate eating chocolate because we might fall into the diabetic illness which is very bad. But though, chocolate is excellent, the best way to relax anything anywhere. I use to eat chocolate before sleeping for getting a more relaxing sleep and for waking up happy because of the benefical substances within chocolate. Thank you very much for sharing this great article and for making me hungry with that picture, lol! Keep up the good work! totally agree that everybody can use more chocolate in their lives. Those look divine and im definitely going to test out your recipe. Thanks for sharing. yum yum for my tum tum!!! send some over. Good Lord. That looks so good. You know those soft, melt in your mouth gourmet chocolates? Yeah, they’re like that. Chocolate? Hello. After this week, I am definitely up for chocolate. Combined with Peanut Butter? OMG. Next time I see you, remind me and I’ll make you some. It’s pretty darn amazing. Seriously, the PERFECT ending to a rather crappy week. :) And if anyone else needs some chocolate, I think it’s you! Those look amazing. Do you have my shipping address? I think you may need to send that to me again. Tomorrow, one of my “girls” in my Sunday school class is having a birthday. Those girls are getting extra lucky, I’m telling you! Sometimes, NOTHING but chocolate will do.